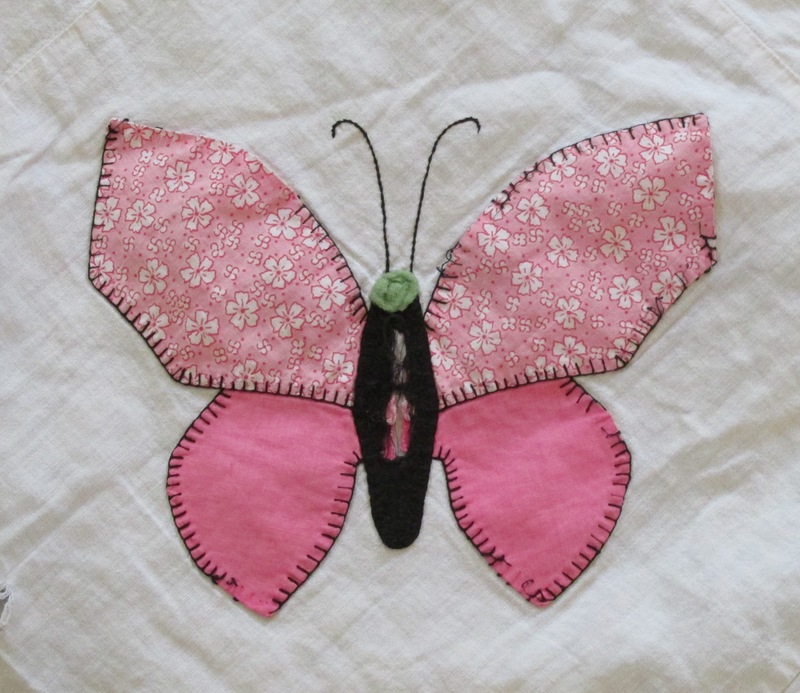 My grandmother gave me this butterfly quilt years and years ago…. probably 25 or 26 years past. It was filled with that old fashioned batting that made the blanket hug you and keep you warmer than the average quilt. At one time the colors were vibrant and cheery, the sweet soft pinks, turquoises and lavenders of the 40s. The pea-green backing was less than my favorite color, but hey, it was on the back. This quilt was well loved! 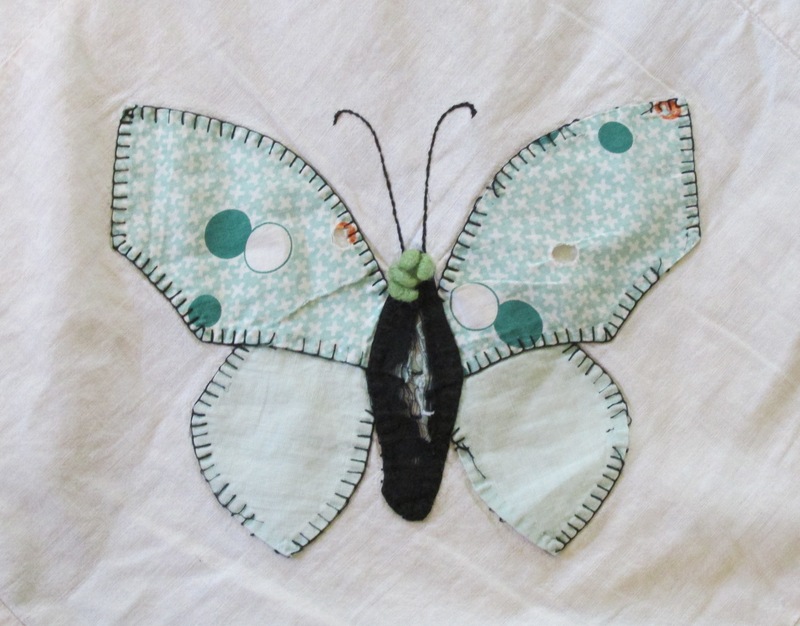 Several times over the years, before it was completely shredded, I thought of re-doing the blanket stitch around each butterfly…. but that task never made it high enough on my daily to-do lists. 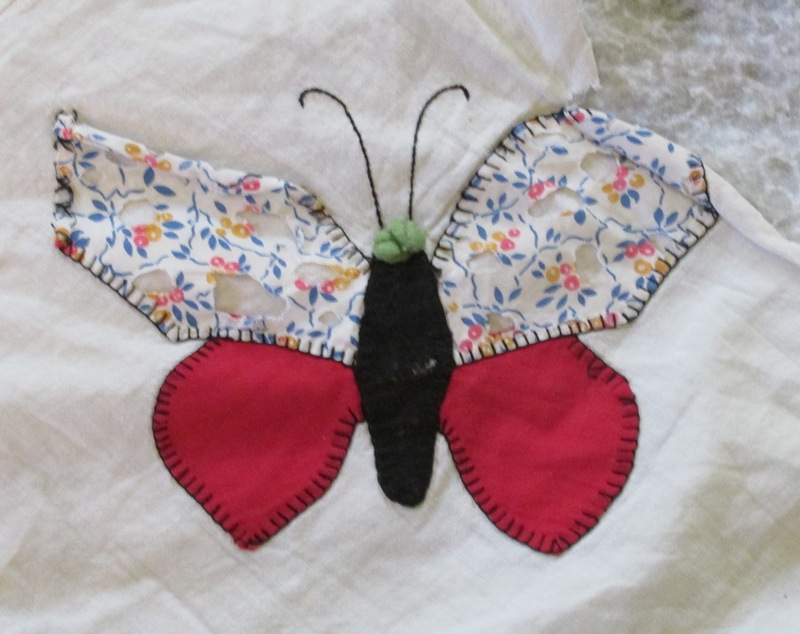 So the butterflies slowly flew away as did the days of the quilt’s life. It became my son’s favorite blanket that he used on his bed for years. It was under a presentable comforter so I didn’t care how ratty it looked. Then he went on a church camping trip and took it as his only blanket…. making us look worse than homeless people. I tried to simply talk him down from using it, but NO! This was the coziest quilt in the galaxy. I waited to confiscate it until the dark of the night when it had fallen off his bed and he was snoring. Hidden under my bed is where it remained for several years because I was not sure if I could throw away the quilt my grandmother handmade and gave to me. Yesterday I was obviously low on nostalgic sensibilities. The quilt came out from under our bed and I seriously took in each butterfly, analyzing if they were still redeemable. Some had no wings. At all. The ones that did have wings also had holes that could not be repaired. 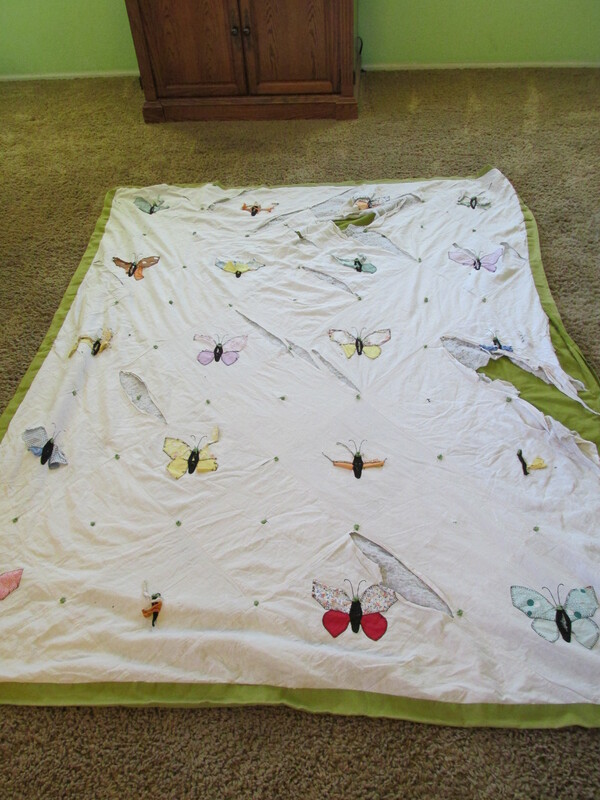 Rolling up the shabby blanket as I headed for the garbage can I realized that if I didn’t take a picture the memory of the butterfly quilt would fade. Hence, the photo and the story written for posterity, so my grandchildren will know the tale of the pea-green, vintage quilt that they never got the pleasure to wrap up in. Goodbye butterflies! You served us well! P.S. O.K., after writing this, I went and got it out of the garbage and cut out and saved a few of the butterflies. I figure I could frame them for the laundry room or for my future sewing room. I guess I have a bit more nostalgia today than yesterday. Thankfully it wasn’t garbage pick-up day! Two days ago my first born son turned 15-years-old. He is taller than me. I’m not sure if I could take him anymore. He has more muscles than Jack LaLanne. ……..Ok, no he doesn’t. I just looked up Jack on google. But my son has the potential of turning into the juicing giant. Wasn’t it just a few months ago when my chubby, blonde little boy was yelling every word and stuttering because he was so excited about life??? Wasn’t he telling me, just weeks ago, that “Daddy take good care for you, Mom.” Where have the years gone? Sadly, said son’s birthday happened to be on the busiest day of our week…. really, the ONLY day we all leave the house together. I did make cupcakes and take them to co-op… like all good homeschooling moms. He asked for vanilla cupcakes with vanilla icing. WOW! Go crazy! I called him from Walmart to make sure I got the right kind. Then I asked what kind of cupcake papers he wanted…. Dora… Mickey Mouse… Cars… Cinderella. He said he didn’t care as long as the cake and icing were vanilla. I bought purple. And what gift did my 15-year-old ask for on his birthday? Money to go on a missions trip to build houses in Mexico in October. What kind of kid asks for missions trip money for his birthday? Maybe the kind of kid who asks every Friday night if he can go downtown and feed homeless people. Or the kind of kid who spent his summer vacation feeding men on skid row in Los Angeles. He recently told his Dad that he didn’t think he was doing enough for others. To which my wise husband replied, “You are doing WAY more than the average kid your age.” My brilliant son retorted, “I’m not an average kid.” SO TRUE! I couldn’t be more proud of my 15-year-old son. 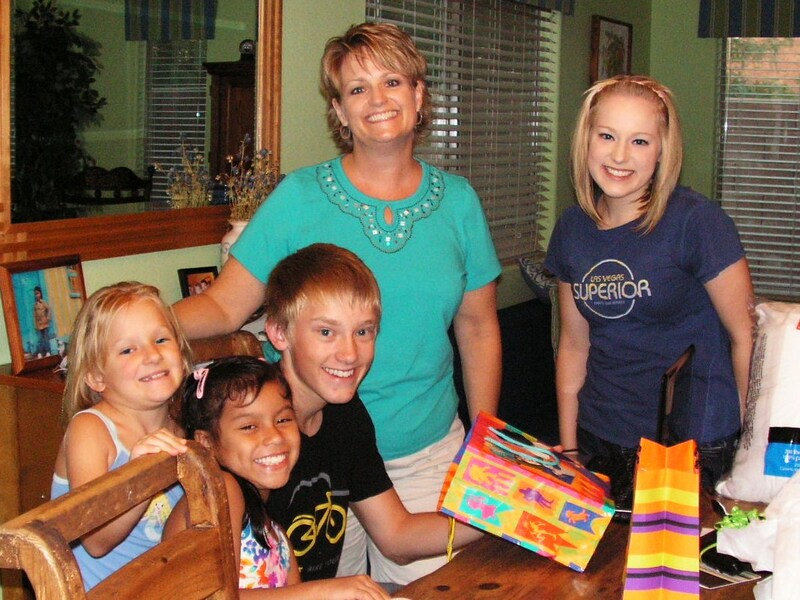 We had a family gift opening for Aus… with little girls invited. :o) But he simply wanted $$ for missions, so no grand party was had. Weird, I know.